Posted on February 1, 2019 February 16, 2019 by Gregg A. Can I Take CBD for Migraines? A migraine is not just a headache. This is something that nonmigraine sufferers do not tend to understand. But if you are someone who suffers from these awful things, have you ever thought about CBD for migraines? In fact, a migraine is much more severe and in some cases even debilitating. It is comparable to a throbbing headache. It normally affects one side of the head rather than the whole head. In addition, migraines tend to present a wide variety of symptoms to go along with them. Most often, migraine sufferers complain of disturbed vision and nausea. Migraines can last for several hours or for as long as 3 days. In many cases, migraines create in a person the need to lie still for hours. This is because the migraine is so intense, the only thing that helps the victim feel better is lying in a cool, dark room. Unsurprisingly, the array of symptoms can cause a massive impact on the lives of those suffering from migraines. It can also impact the lives of people around them, whether at home or at work. If you’re seeking relief from the symptoms of migraine attacks, CBD for migraines may be the answer. We do not yet have enough evidence to form any sort of irrefutable proof, but the anecdotal results so far are promising. The cannabis plant contains over 100 known cannabinoids. These are chemical compounds found in cannabis that interact with the system of human neuroreceptors. 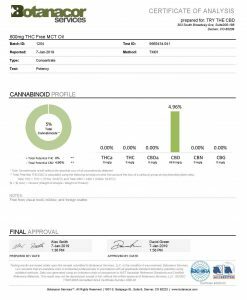 Tetrahydrocannabinol, or THC as it is commonly referred to, is the most widely known… for now. 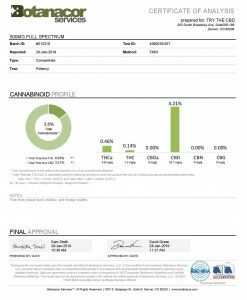 THC’s nonpsychoactive cousin, Cannabidiol, or CBD, is rapidly making a name for itself. People are beginning to understand it as a powerful player in the medicinal cannabis world. It lacks any mood altering properties and is therefore used in a medicinal context. CBD oil is a concentrated extract of this amazing compound. It has been making waves as a treatment for countless medical conditions and symptoms. Moreover, it has quickly become nearly as well known as THC in just a few years. The medicinal cannabis movement began in earnest in 1996, when the state of California made it legal to use it with a doctor’s prescription. There was still a lot of residual taboo surrounding the plant at that time. This was partially due to decades of prohibition and all of the negative propaganda that permeated the collective American psyche. Slowly, however, this began to ease off. As more and more states enacted legislation that made medical cannabis legal, the way people viewed it began to change. CBD has helped propel the medical cannabis movement into the mainstream. 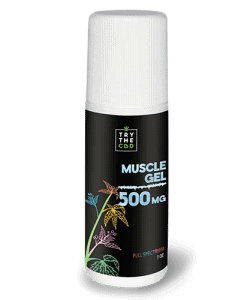 This is due to increasing acceptance that it just might be able to help alleviate symptoms of many chronic ailments. But also, since it has no psychotropic effects, it can be presented as a bona fide medical treatment. Doctors are still deciding whether they are behind it, and scientists need to conduct further research. Still, with no consciousness-altering “side effects,” the future looks bright for CBD for migraines. Naysayers have long contended that medical marijuana is an excuse for stoners to legitimize themselves and their culture when all they really want to do is get high. Luckily, CBD has effectively voided that argument. You don’t get high on CBD. It is simply and entirely used for its medical benefits. In doing so, CBD for migraines has been propelled into the spotlight as a new modality for patients. This is especially applicable to those suffering from a wide range of symptoms who want to treat themselves naturally and effectively. By using cannabis, they get to do so, but without the baggage that comes along with the high. Not long ago, CBD was nearly unknown. It was only a discussion among the most informed medical cannabis activists and health practitioners. Once its value began to come out into the public eye, CBD oil started showing up everywhere. There remain four states in the union that retain full prohibition legislation on their books. However, it’s becoming increasingly difficult for those states to justify depriving their citizens of this medicine. The trend will likely head in favor of cannabis, not keep it outlawed. 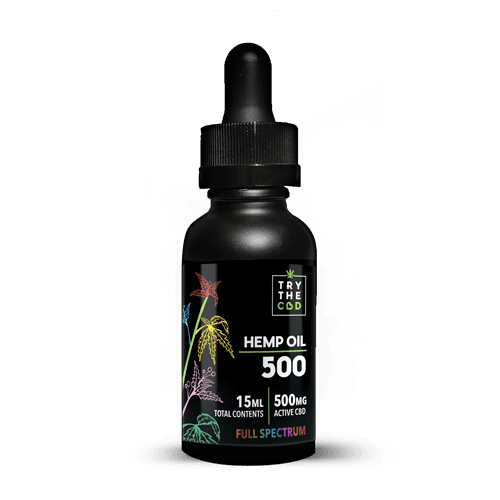 The medical benefits that CBD oil offers are numerous. CBD for migraines is just one of many. 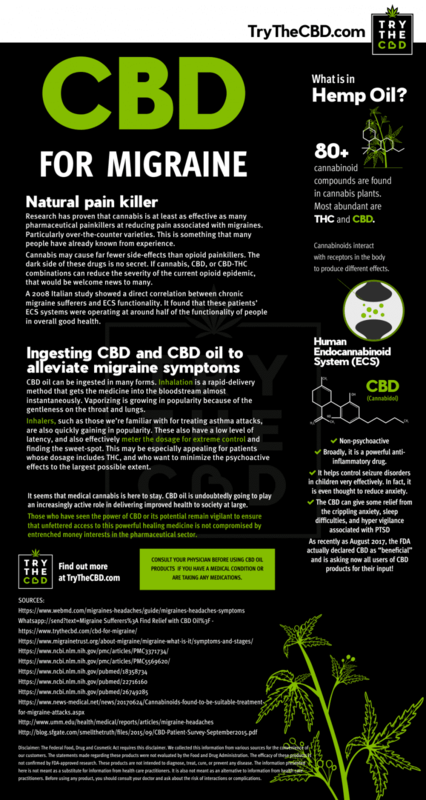 CBD’s anti-inflammatory properties seem to be at the forefront of our current understanding of its uses. It is being used today in the treatment of ailments associated with inflammation. Since inflammation of all sorts can lead to a range of chronic conditions, CBD oil is a potential candidate for treating such problems. Symptoms related to inflammation can be alleviated by using CBD oil. This covers a dizzying array of medical diagnoses. 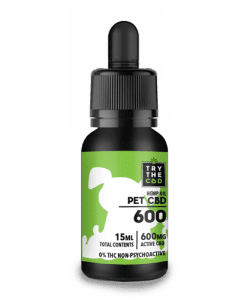 CBD for migraines and that’s it? Not so fast! CBD’s ability to assist in the mental health arena is another major draw that attracts interested parties. CBD isn’t just able to improve a person’s physical health. Much more, it seems that CBD may have an effect on mental health as well. It binds to special receptors in the body and can possibly elevate the mood and quietly worried minds. It may also help with cognitive disorders such as schizophrenia. The connections are unclear still, but they are worthy of investigation without a doubt. All in all, CBD’s interaction with the mental health community is likely to grow and expand. As more and more people benefit from all that CBD has to offer, the stigma will continue to loosen. People who suffer from conditions like anxiety and depression report that CBD helps elevate their mood and soothe their mind. In addition, some of the most surprising reports suggest that CBD may even be able to assist in treating or at least alleviating disorders as serious as PTSD. If you take time to look up the connection between CBD and PTSD, you are likely to be shocked and amazed. CBD for migraines is rising in popularity. Research has proven that cannabis is at least as effective as many pharmaceutical painkillers at reducing pain associated with migraines. This is particularly true of over the counter varieties. This is something that many people have already known from experience. 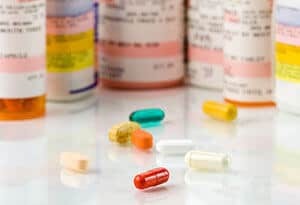 Cannabis may cause far fewer side-effects than opioid painkillers. This is a big deal. The dark side of these drugs is no secret. If cannabis, CBD, or CBD and THC combinations can reduce the severity of the current opioid epidemic, that would be welcome news to many. CBD for migraines won’t be the only major change maker. It is killing thousands of people across our country. If a simple and natural option like CBD could help by providing a more safe alternative, the world would be a better place. Human physiology includes a system that seems specifically designed to bind with cannabinoids. 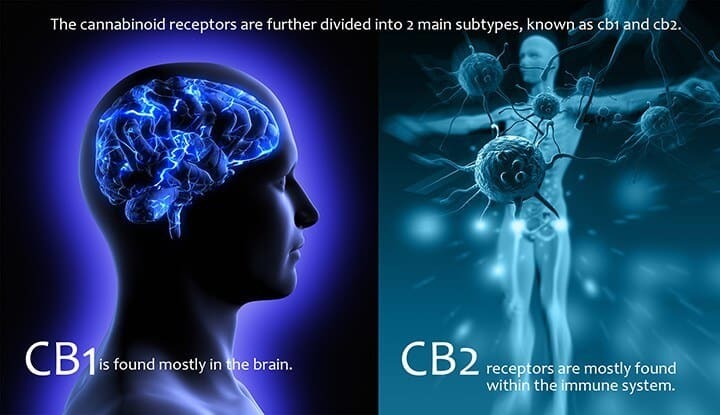 Our bodies produce “endocannabinoids” that interact with the same specific receptors as exogenous cannabinoids. This endocannabinoid system (ECS) plays a role in the way our bodies generate sensations of pain. A 2008 Italian study showed a direct correlation between chronic migraine sufferers and ECS functionality. It found that these patients’ ECS systems were operating at around half of the functionality of people in overall good health. This holds true for other chronic conditions as well, but subsequent research found that, intuitively, cannabinoids are indeed an effective treatment for migraines. If endocannabinoid deficiency is a cause of migraines, then this conclusion would be in line with that. 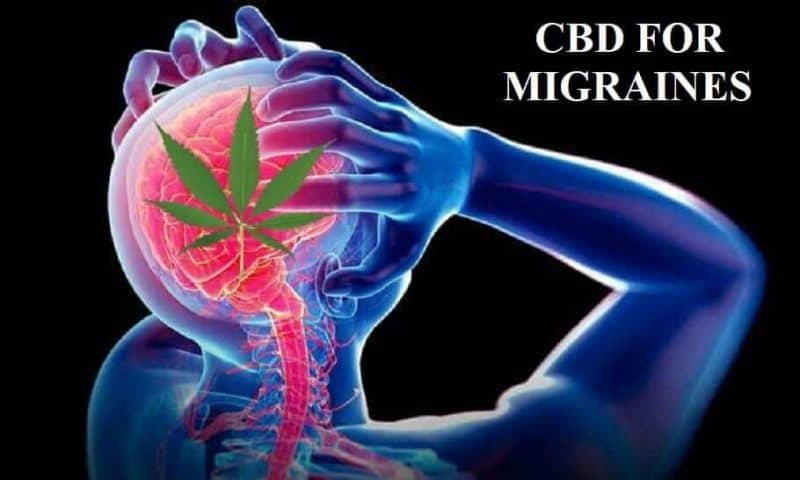 The specific efficacy of CBD for migraines in treating migraines was addressed somewhat inadvertently in a broad-reaching study conducted by a CA medical cannabis company called Care By Design in 2015. The study looked at 621 patients with a wide range of medical histories and conditions. The purpose was to assess the effects of CBD on a variety of health problems. 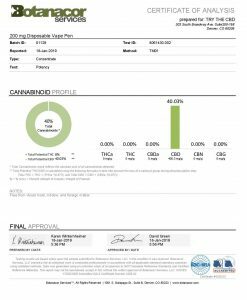 The result was very favorable with regard to CBD for migraines. A study of 2016 about the use of medical marijuana for migraines found that 40 percent of the 48 individuals who were surveyed reported fewer migraines. This study was published in Pharmacotherapy where the biggest complaint against marijuana was drowsiness. Another complaint was how some of the surveyors did not get the proper dose. In the most recent study of CBD usage and its effect, a study was published in Cannabis and Cannabinoid Research. This one happened in 2017 and it explored the effects of oral cannabis. 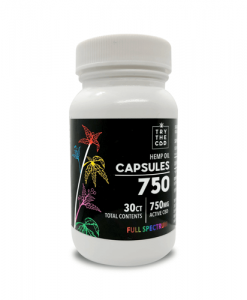 During the course of 6 months study, 26 individuals who were suffering from medication over usage headaches took oral cannabis with Nabilone or just ibuprofen. They were taking each combination over eight weeks with an interval of eight weeks during the change of each combination. The result concluded that the participants felt much better when they took the combination of Nabilone with oral cannabis. The users of cannabis-nabilone combination reported many improvements in the headaches and also a better quality of life. All the migraine sufferers reported a decrease in severity or discomfort. Every last one of them! This should be proof enough to cause even the harshest skeptic to take another look. In contrast, 50% of patients with other conditions reported improvement. This suggests that CBD may be a particularly potent treatment when used by migraine patients. Serotonin is a powerful neurotransmitter that originates in the human body. It drives mood, appetite, libido, sleep, memory, and more. Migraine headaches have been linked to a serotonin deficiency, and cannabinoids slow the degradation of serotonin (among other mood-related neurotransmitters). Therefore, it makes sense that cannabinoids like CBD can decrease the effects of depleted serotonin, such as migraines. People ingest or take in CBD oil in all kinds of forms. There is truly something for everyone. Inhalation is a rapid delivery method that gets the medicine into the bloodstream almost instantaneously. Vaporizing is growing in popularity because of the gentleness on the throat and lungs. This is especially true when you contrast vaporizing with smoking. In fact, even cigarette smokers are changing their lives through the introduction of CBD. But that’s a story for another time. Inhalers, such as those we’re familiar with for treating asthma attacks, are also quickly gaining in popularity. It has a much more medicinal feel. These also have a low level of latency, and they also effectively meter the dosage for extreme control and finding the sweet spot. 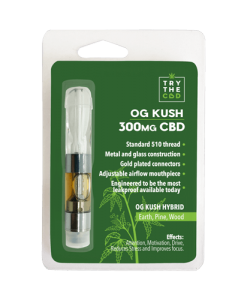 It is great for those who want to exercise close control over their CBD dosing. This may be especially appealing for patients whose dosage includes THC. These are people who may want to minimize the psychoactive effects to the largest possible extent. It seems that medical cannabis is here to stay. CBD oil is undoubtedly going to play an increasingly active role in delivering improved health to society at large. Those who have seen the power of CBD or it’s potential remain vigilant. The goal is to ensure that access to this powerful healing medicine is not compromisable by ulterior money interests in the pharmaceutical sector. Increasingly, in the United States and around the globe, communities comprised of neighbors, family, and co-workers are embracing cannabis and CBD oil. Society is beginning to see innocent old CBD as a valid, effective treatment for an ever increasing number of ailments. Even some of the doctors unofficially or officially prescribe CBD as a medicine for treating different ailments including migraines. It doesn’t matter if you’re not into the marijuana scene and don’t want to associate with the practice of getting high. The CBD community is full of people just like you! CBD provides a safer, more natural remedy that appeals to people from all walks of life. CBD is a non-potent form of cannabis and is very different from marijuana. This is why CBD will not get you high if you may think that if it does. It just eases and treats your ailments in a non-evasive way. Everyone deserves to be healthy and comfortable in their bodies. CBD oil may help reduce much suffering, not least of all by relieving the symptoms of migraines. We ought to investigate these advantages fully with a view to bringing this potent healing agent into the lives of everyone that might benefit. 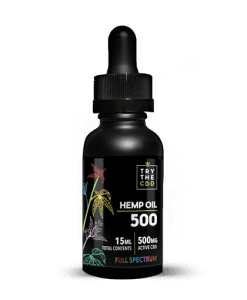 If you’re ready to try CBD for yourself, feel free to browse our wide selection of CBD products. 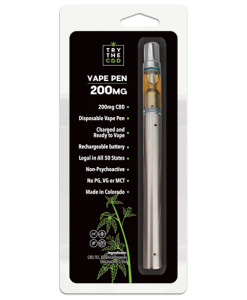 We sell CBD in a variety of forms to appeal to even the pickiest consumers. You are sure to find something that catches your eye. As you may have read in the information above, that CBD us consumable through many different ways. We will also like to inform you that all of the methods prescribed are non-evasive and do not incite complication in the user. Any questions? Don’t hesitate to reach out and contact us! Disclaimer: The Federal Food, Drug, and Cosmetic Act requires this disclaimer. We collected this information from various sources for the convenience of our customers. The statements made regarding these products were not evaluated by the Food and Drug Administration. The efficacy of these products is not confirmed by FDA-approved research. These products are not intended to diagnose, treat, cure, or prevent any disease. The information presented here is not meant as a substitute for information from health care practitioners. It is also not meant as an alternative to information from health care practitioners. Before using any product, you should consult your doctor and ask about the risk of interactions or complications. This entry was posted in Featured Story and tagged cannabis oil for migraines, cbd and migraines, cbd for migraines, cbd migraines, cbd oil migraines.